Sanjay is 2 years old. 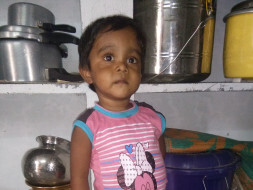 His parents are facing the terrible-twos phase not because he is throwing tantrums like any other toddler, but because he has been given just 3 months to live. 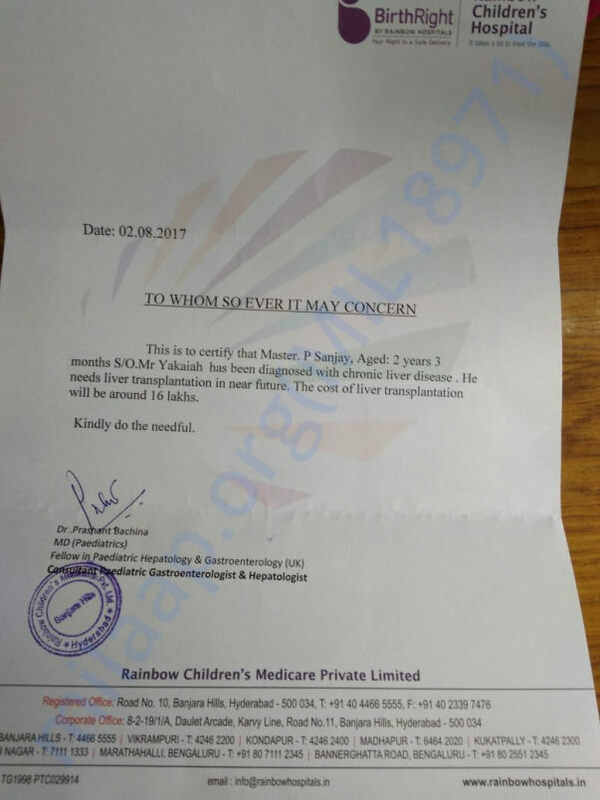 Sanjay's liver is failing and he needs a liver transplant. Yakaiah Pachimatla and his wife grew up a rural village in Telangana. Their village had no provision for education, electricity, healthcare or sanitation, so when they got married 5 years ago, this couple moved to Hyderabad hoping to provide better for their children. Unfortunately, lack of education and proper identification documents forced Yakaiah into a low-income role as a personal car driver for a salary of Rs. 8500/month. "We have two children. Sanjay was born 2 years ago. My wife noticed that his stomach was not normal. He was falling sick very often. She used to take him to every doctor near us and they could not tell what was wrong except that he had a fever." Yakaiah is now out of options. He is taking odd jobs to make as much money he can to pay for the surgery that will cost Rs. 16 lakhs. If they cannot come up with the funds within 3 months, Sanjay does not stand a chance. It gives me immense pleasure in informing you all that Master Sanjay had the liver transplant done on 16/11/2017 and recovered well. His mother was identified as a potential donor and she is doing well too. He regularly comes for the followup and is very active. His growth is normal to his age. God Bless you. Praying to god to save this little one.